I sometimes take what is called a busman’s holiday – which in contracting terms means work away from the management side, and more in actual testing activity. This is valuable for me, as it keeps my skills fresh (and good for company as they get a more experienced tester). It also allows me to see the project from a different angle, to put myself outside of a comfort zone into more direct dealings with other testers and developers. Its a bad joke, that’s been around for a few years – usually as comment on how Agile has failed, or is perceived to have failed, down to the methodology itself, rather than people/implementation. Christ, spare us all from whining iPhoners! 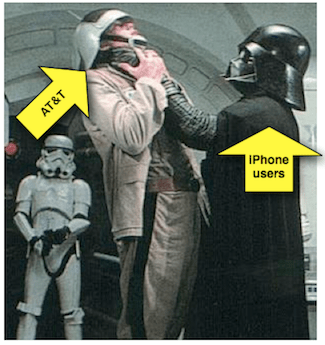 Interesting (but I am sure random) choice of picture, putting iPhone users in role of evil Darth vader, and AT&T in role of lowly Empire “cannon fodder”. I read this article, then read the associated stories and thought – well that makes total sense. Bandwidth is not unlimited, whatever mobile broadband sales/marketing says. If you think about it, how can it be? And the millions of Nathan barley iPhone users are clogging up the airwaves with trite shallow data. So I say f*ck ’em, and go for it AT&T – iPhone users want to try and bring the mobile network down? Get a life and protest against something that actually matters – this is just shallow, but in keeping with the average iPhone user profile.